Vamizi’s Marine Conservation and Research Centre frequently hosts visiting researchers, scientists, conservation experts and volunteers with a passion for protecting the precious underwater world that surrounds this paradise island. The focus of their work ranges from fisheries monitoring, studies of coral reef reproduction, taking biopsy samples from humpback whales and tagging grey reef sharks. One such team, headed up by Yara Tibiriçá from ACCM Závora Lab and António Manuel Malaquias from the University of Bergen visited Vamizi recently to study one of our most highly developed and effective predators on the reef; the nudibranch. These brightly coloured sea slugs often go unnoticed by divers; this may be no surprise as they can be just 1mm in size. Get up close and you will find these tiny creatures are the most exotic and spectacular display in the ocean. The nudibranch group are a fascinating and important part of the marine eco-system. 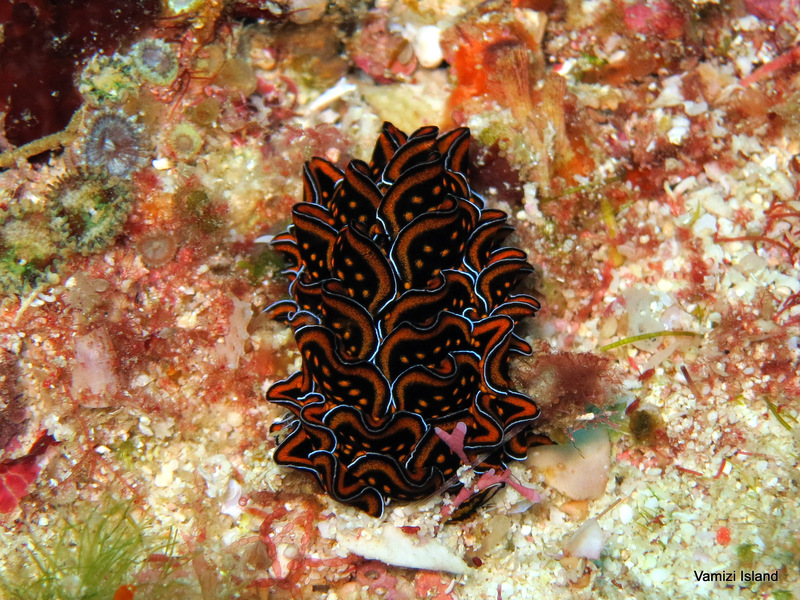 Sea slugs are highly diverse with more than 5,000 species described and many to be discovered. Their vivid colours are a warning to any potential predator that they are poisonous and can be deadly if eaten. The defensive chemicals of nudibranchs are so impressive that they have been studied to find the cure for diseases such as cancer. Their life history is interesting, as they are hermaphrodite with mutual fecundation, meaning that they have a set of reproductive organs for both sexes but also need a partner to mate. However, some of them are cannibals, so finding a partner can be a game of chance! Other nudibranchs and sea slugs have the amazing capacity to steal the chloroplasts from their food and photosynthesize to survive during several months of starvation time. The dragon sea slug (Pteraeolidia ianhina) can also lose parts of their body to escape from predators, just like lizards. Yara is writing her PhD thesis on the nudipleura (nudibranchs and pleurobranchs) of Mozambique. Her objective is to document the unknown diversity of these fascinating little animals along the coast, as well as to solve some complex questions about the species. She has already found 30 previously undiscovered species and recorded the first sightings in Mozambique’s waters for a further 300 species. The sea slugs of Northern of Mozambique have never been documented before and Vamizi is a great tropical hotspots for nudis. António is an Associate Professor in the Department of Natural History of the Unviersity Museum of Bergen in Norway. His research is focused on the study of the patterns and causes that drive present diversity in the oceans. Cephalaspidean gastropods, a group of poorly known marine snails, are his favourite underwater animals and he uses morphological and DNA characters to recognize species and reconstruct hypotheses of evolution and relationships at species, genera, and family level. During a two week visit to Vamizi, Yara and Tó spent time exploring the turquoise Indian Ocean reef gardens around the island. Many of these areas are well known to Vamizi’s divers – such as Neptune’s Arm, Cave Wall and the Point. In total, they collected samples from over 40 different species. Now they are taking these samples to the lab to look into the taxonomic details and confirm the nudibranch samples’ identities through molecular studies. At least three species found in Vamizi are potentially new to science, and if this is confirmed, they will be described and named, which will be one more piece in the fascinating puzzle of biodiversity. Keep following us for results of Yara and Tó's analysis and you might get to meet a new “Vamiziensis” species.